Help protect land, water and wildlife habitat while there is still time! Sponsors are part of a very special event that draws guests from all over Colorado and the country, while supporting land conservation in Colorado. Your business name will be in front of hundreds of people during our race and thousands of people during our promotional outreach. Your kindness and dollars help protect land, water and wildlife in southern Colorado. Support a Healthy Future – Become a Youth Sponsor! For just $40, you can sponsor a youth athlete to run the Hardscrabble Mountain Trail Run. San Isabel Land Protection Trust seeks to support youth and a healthy future by offering them free entry into our race. Each year our 17 and under guests run FREE because of the generosity of sponsors like you! Premier placement on race T-shirt, website and all race swag and promotional materials. Exclusive right to sponsor the start/finish line. Prominent display of sponsor banner at race. Corporate booth space and prominent placement at race. Option to add brochure and race premiums in swag bag. Special ‘thank you” in San Isabel Land Protection Trust’s newsletter and email announcements. Logo inclusion on race marketing materials. Option to add brochures and premiums to race swag bags. Corporate booth space at event (10' x 10'). Prominent display of sponsor banner at race. (Sponsor to provide banner). Premium position of logo and link on the sponsor page of our website. Special ‘thank you” in San Isabel Land Protection Trust newsletter and email announcements. Option to add brochures and add race premiums to race swag bags. Corporate booth space at event (10’ x 10’). Logo and link on the sponsor page of our website. Option to add brochures to race swag bags. Special “thank you” on sponsor page of website. Our goal is to sponsor 100 young people. Help us reach our goal! In return, you will get the satisfaction of knowing you are helping to create a vibrant and healthy future for our youth! You'll also get a special thank you on our website and in the San Isabel Land Protection Trust newsletter. "I do not sign up for a lot of races but running in a race that supports land conservation was something I could not miss. I love the fact that we’re running on a conserved ranch. 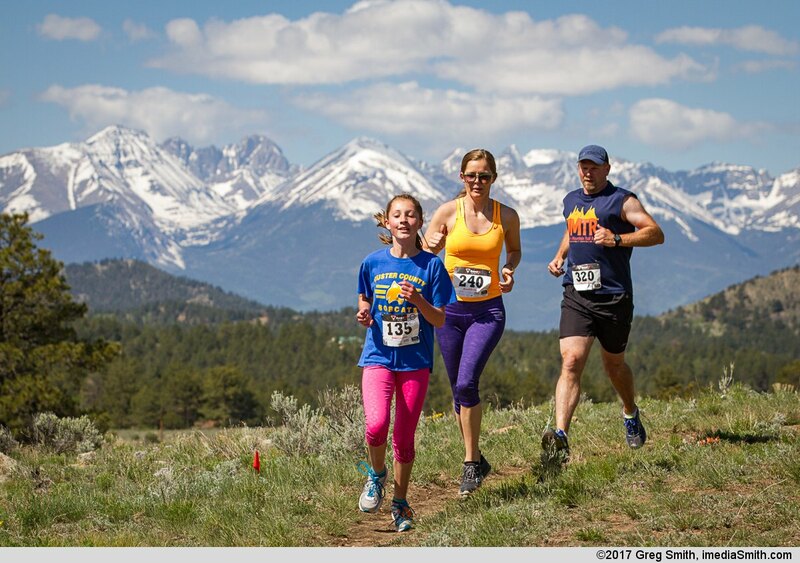 The course is challenging but fun and the views of the Sangre de Cristo’s are amazing."